Momma Told Me: How does it make you feel? Moving into a house has been a transforming experience. In the condo I always felt I had a defined sense of style and direction, yet I frequently found the small spaces easily felt more cluttered than designed. Now that I have more space then I know what to do with it's been hard to really harness my many visions and determine where to start with such a vast, white, canvas. Thankfully Moll Anderson's latest book, Change Your Home, Change Your Life™ with Color by Moll Anderson has really helped me identify and pursue my unique color story. 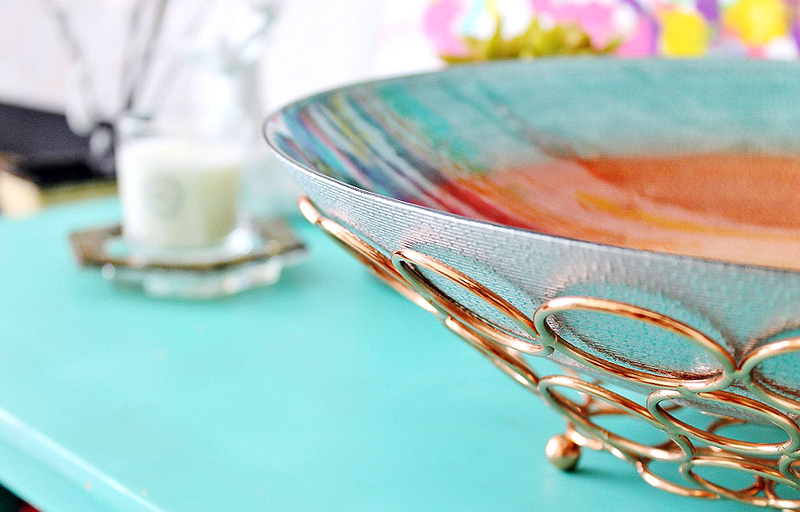 As someone who tends to rely on a riot of color to express themselves I've been fascinated to take a journey through my own personal color connections and truly identify how to put pops of color to work in my home. My biggest fear, when moving into a partially furnished house with rambling white walls was that I would struggle to make my own vision of color style cohesive. It's one thing to dress up for a night with my girlfriends looking like I'm barfing rainbows but my home is an entirely different expression of myself. Color, at it's root, is transforming- and you may be surprised which colors you identify with most, and the power in harnessing them. For example, I always considered yellow one of the boldest statements in the Crayola box, a color I was drawn too, but never really understood how to execute. Change Your Home, Change Your Life™ with Color by Moll Anderson has taught me that there are not only many shades of every color, but many ways to bring color into one's life through playing with textures, light, and more. You may recall, earlier this month, I re-introduced you to Moll Anderson, noted author, dedicated philanthropist and inspiring entrepreneur. 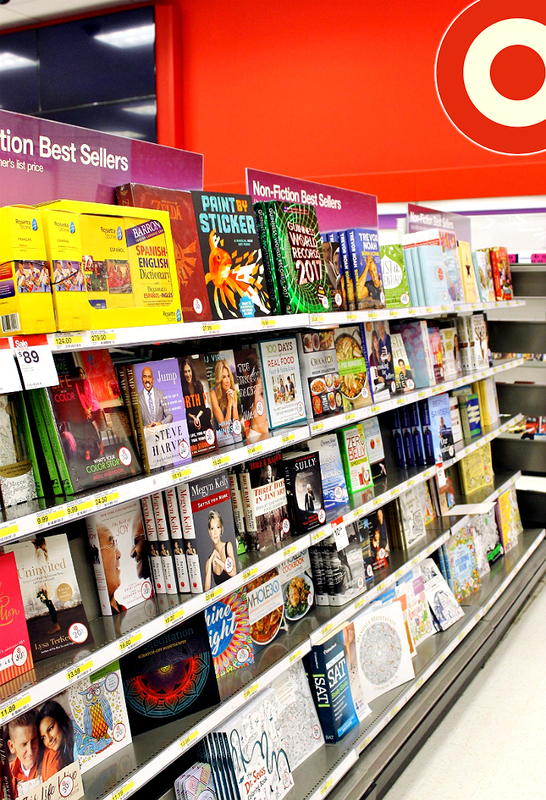 Well, her new book Change Your Home, Change Your Life™ with Color by Moll Anderson arrived in stores this week and you can currently find it with the non-fiction best sellers at your local Target. Don't be deceived by the colorful cover, this is more than just another coffee table book. The contents between these pages are life-altering in the sense that they will force you to reconsider the palette around you and how you embrace color as a means of communication and definition. 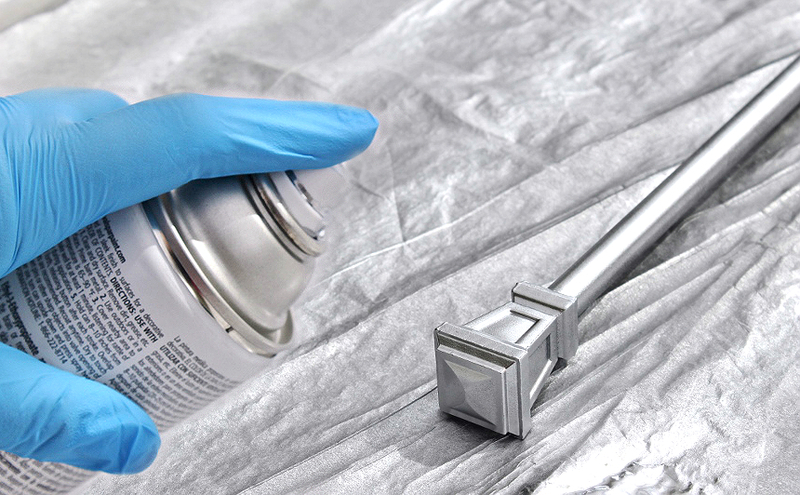 Your color story is something you can change with just a few brush strokes, or an entire renovation. Utilize the book's journal like pages to reflect on your own history with color and unlock the color which identifies you most! I always considered 'my color' pink. When asked what my favorite color is, I will always say pink. 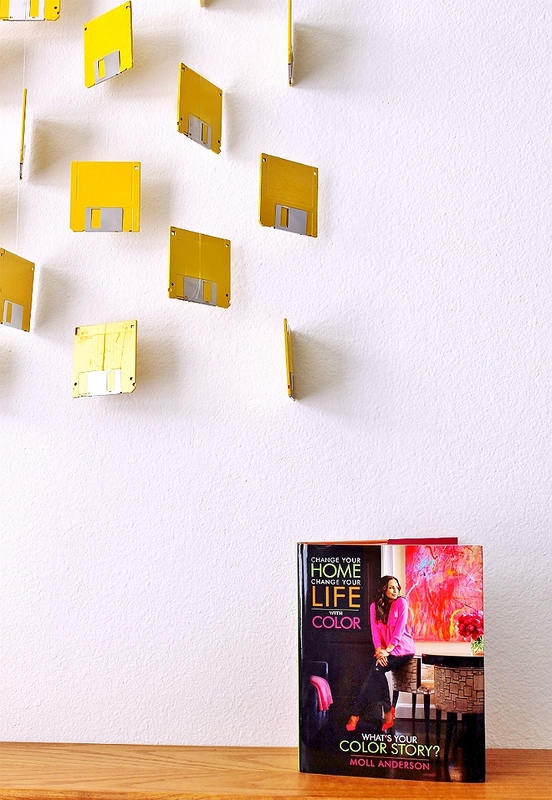 However, through the pages of Change Your Home, Change Your Life™ with Color by Moll Anderson I discovered some of my first happy memories were deeply rooted in the color yellow. I also realized that I, unintentionally, incorporated the color into many routine aspects of my life without ever noticing. 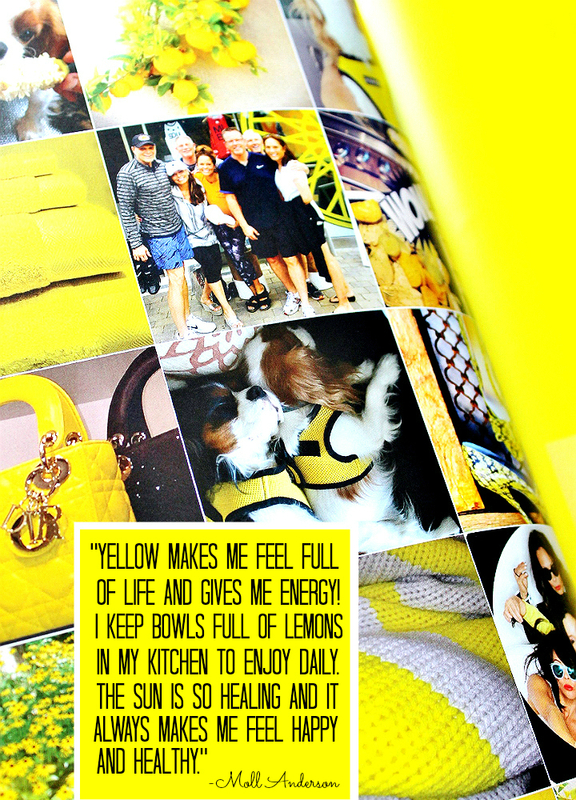 In fact, for me, yellow is a grounding color that reminds me of fresh starts and sunny outlooks. It's hard not to look at yellow and feel instant warmth. 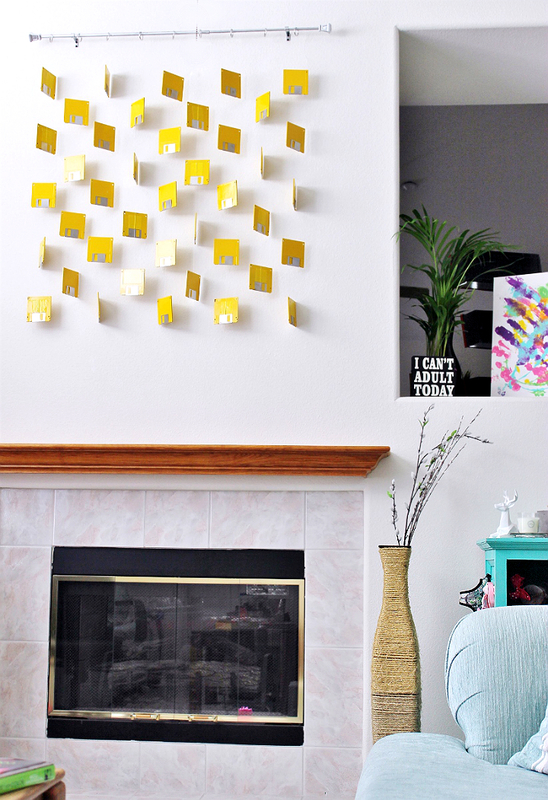 It's for that reason, inspired by Moll Anderson's challenge to explore and embrace color, that I chose to add a dramatic, large, pop of yellow to my main living room. As it stands now the living room you first see upon walking into our home is a muted palette of seafoam green, white walls, and oak wood. 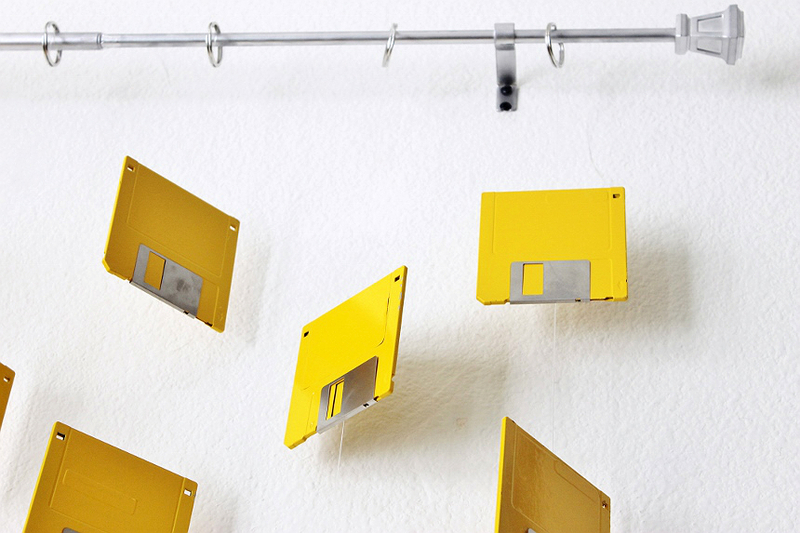 It's 'safe' and very bare, so I knew I wanted to go BIG with my project, a millennial tribute, a floppy disk wall art installation. Ironically enough I'd spotted over 100 old floppy disks sitting in my father's office when we moved him last year and, at the time, had felt a calling to hoard them for a special project. 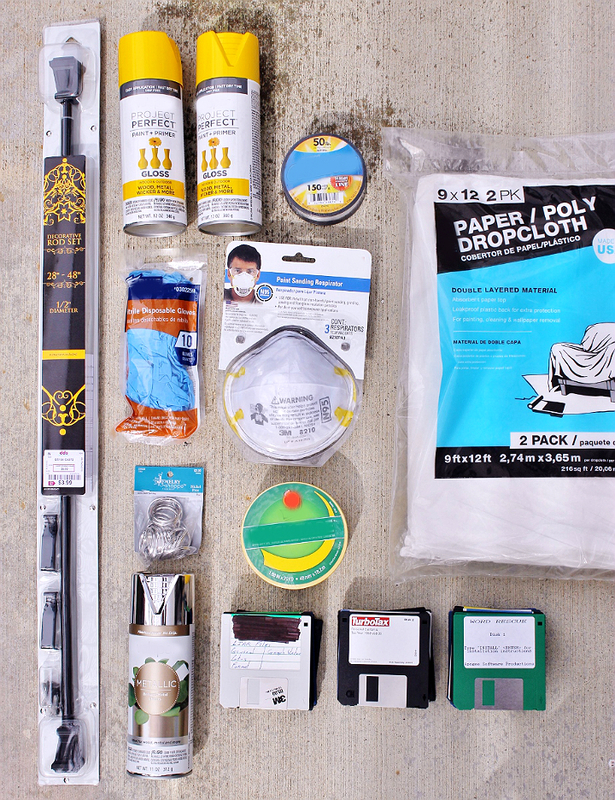 Some other supplies I gathered included a lightweight curtain rod, wide key-rings, fishing wire, a drop cloth, particle safe face mask, spray paint, and duck tape that matched my paint color as close as possible. When I began this project I truly was making the entire thing up from some vision I'd had in my mind. I had no way to know if I'd actually be able to pull it off, or the complications that may or may not arise, but I fell in love with the shade of yellow I'd chosen and was determined to see it through. 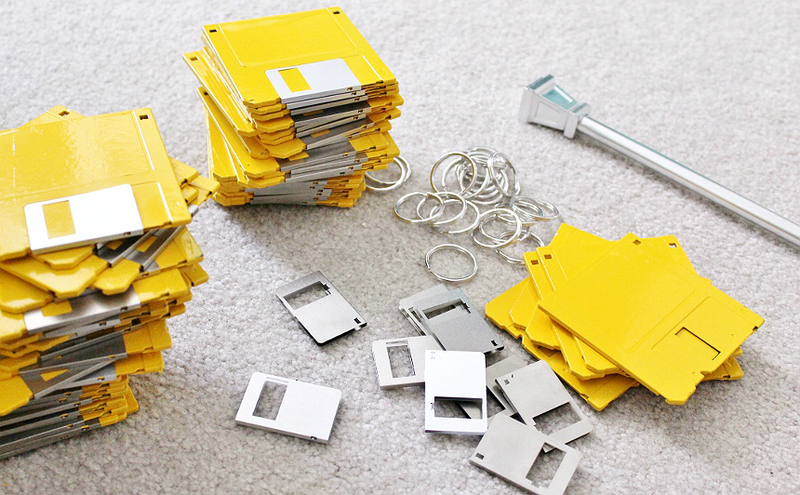 The first step was to remove the metallic clips from all of my floppy disks. With minimal force they will pop off, along with the spring that holds them in place. 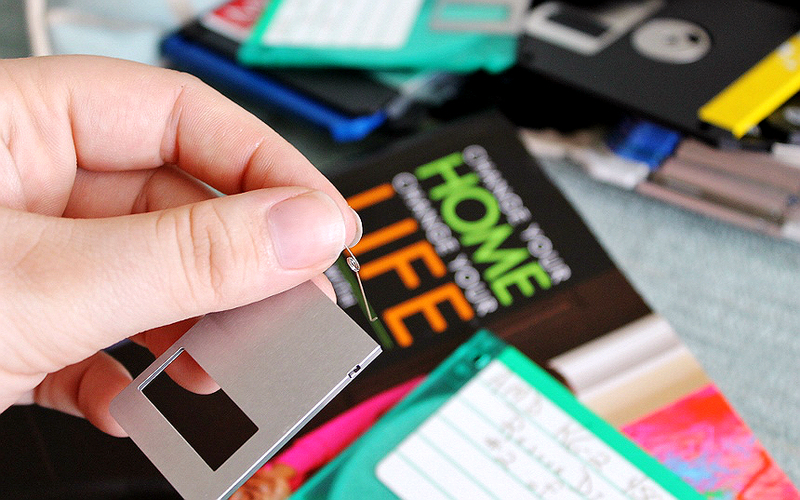 I had no idea how many I would ultimately end up using (I used 41 in the end) so I prepared well over 60 expecting there would be some hiccups and less than perfect floppies as I proceeded. Because I couldn't find a curtain rod in the length I needed, with squared ends to match my square theme, I spray painted my rod to match the metallic floppy clips. 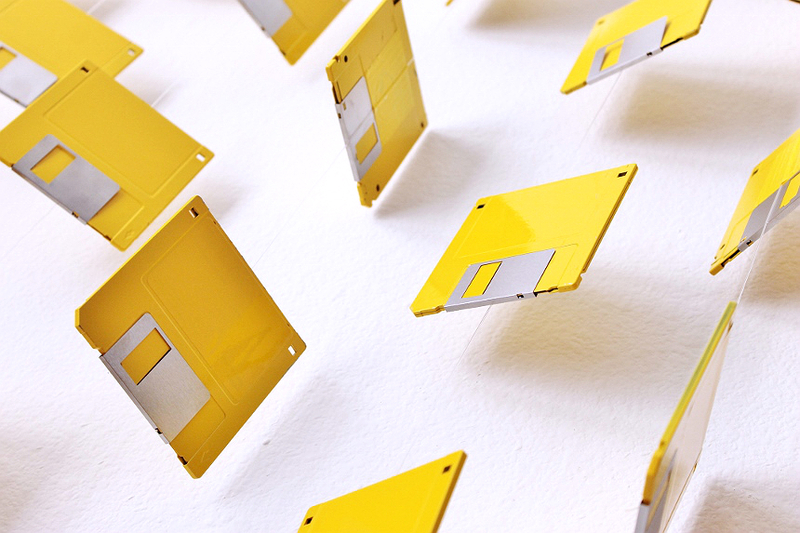 The process of spray painting the floppy disks themselves took several days- Though I did my best to avoid sticking or peeling, I lost a handful to quality control. 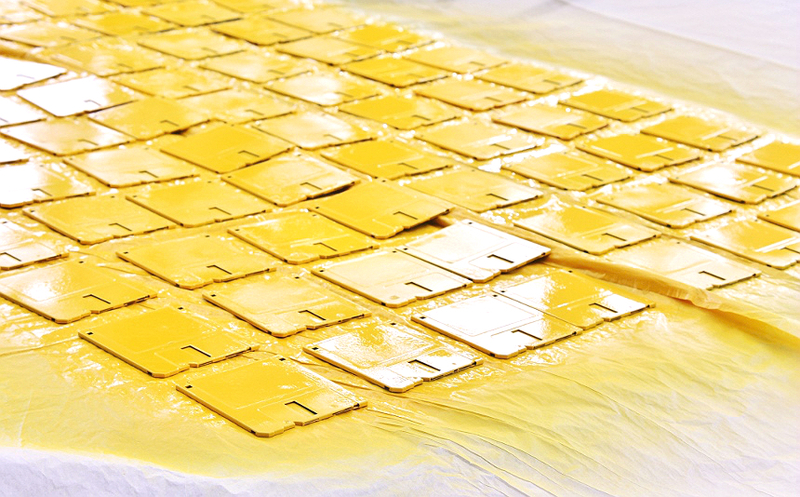 The entire process took 3 and a half cans of spray paint for roughly 50 perfect yellow floppies. Once my disks had dried I reassembled them with fabric gloves to avoid oil smudges and smears on the paint and metal finishes. The clips pop back into place with minimal effort, though some were loose due to the way I'd initially removed them, and those were also set aside. 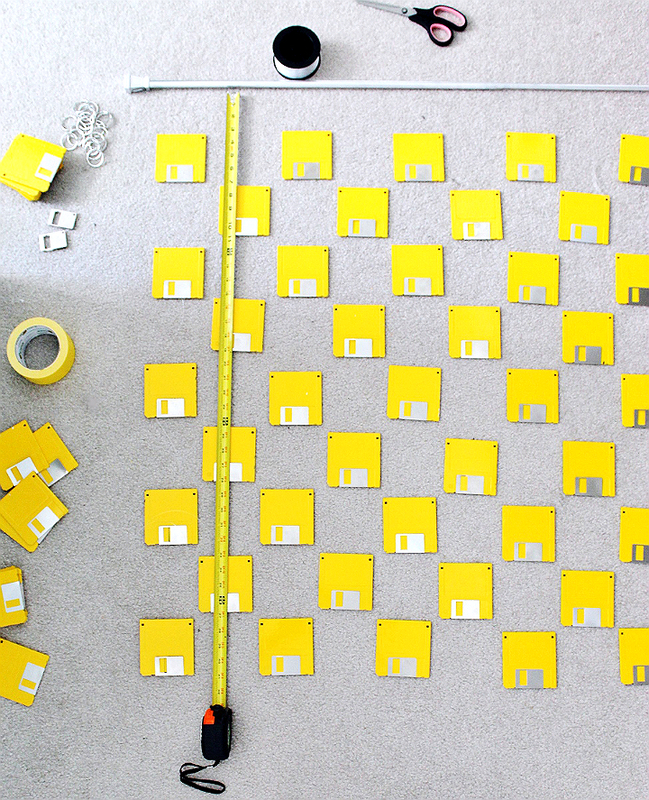 Next I meticulously measured out the spacing of my floppies, laying the final composition on the floor. I began by duck taping the top of my fishing line to the back of my first floppy, then measuring the correct spacing between the next, and repeating the process. 5 in the first row, 4 in the next, and so on, so forth. I found it was essential to make sure the line was taped as close to center as possible, and left plenty of excess line on either end of each strip. Before completing my wall installation I mounted the curtain rod brackets and carefully strung my floppies up to inspect their alignment on the wall. With the key-rings I was able to run the fishing line through without actually tying it off- this enabled me to make adjustments in length and get my 'grid' pattern just right. 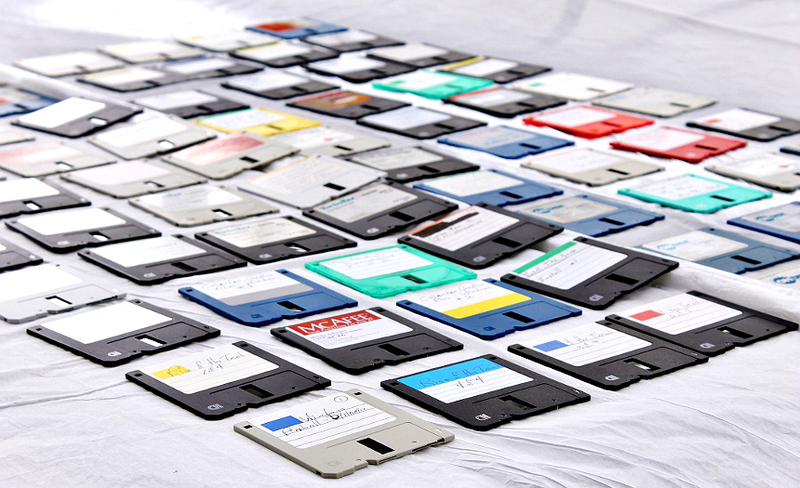 As expected the floppies wanted to 'spin' and turn freely, exposing the taped backs. I wasn't thrilled about this, but, it turns out almost all of the visible backs can be controlled by twisting the wires and manipulating their position. It just takes a little extra time and patience. While there are a few tweaks I'd like to make, and I may notice a disk has spun towards the back every now and then, my general reaction to seeing this fun pop of yellow every morning is to smile. As it stands, our mantle is entirely empty at this time, but we've left some extra height between the 'floppy curtain' (as we call it) for some extra special finds. I can't say what will end up there, but I know we will recognize whatever the items are when we see them. Thanks to my keen understanding of color, and the power behind it, from Change Your Home, Change Your Life™ with Color by Moll Anderson I'm certain to style bolder than ever before! What Daughter Says: Color can instantly change the mood and direction of any setting- explore how color impacts you and learn how to better harness it within your life. I love how you took something that most people would just throw in the garbage and made such a cool statement piece for your living space. 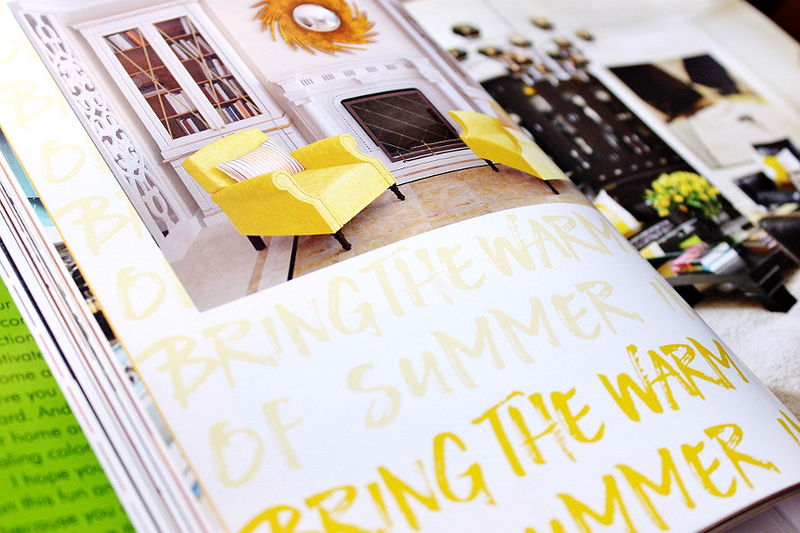 The yellow really brightens up what may otherwise be a plain are of your house. Awesome job! I love that you repurposed familiar items from your past. We are constantly buying really great frames and mats from Salvation army and spraying them other colors (when I say "WE", I mean Walt.) 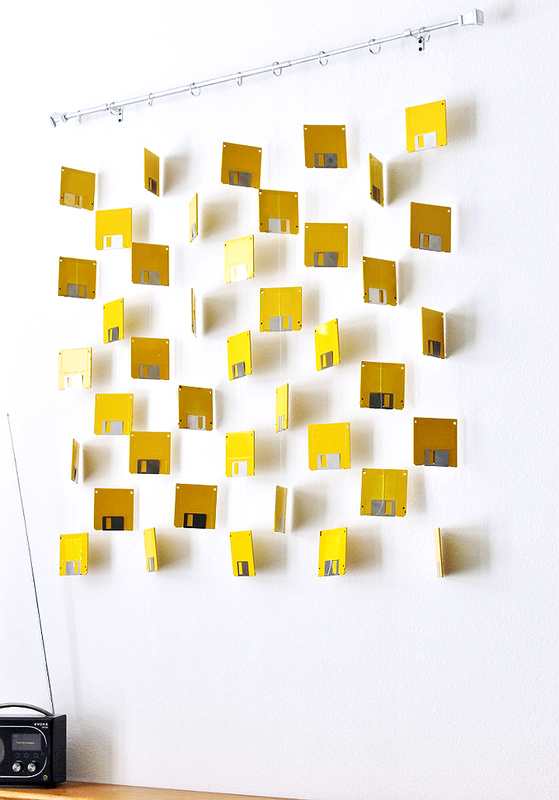 The yellow is fabulous for those white walls and California. I am a neutral wall kind of girl, and love to put the color in the accessories. What a neat idea. I'm not sure I still have any of these laying around but I love that you didn't just toss them! Wow! This is pretty amazing, my wife qill surely love this cool diy, it looks vibrant and unique. What a fun and unique piece that adds that vibrant pop of color! I added lots of color recently and love it. This tutorial is so easy to follow. I will be making this as I already have the materials on hand. 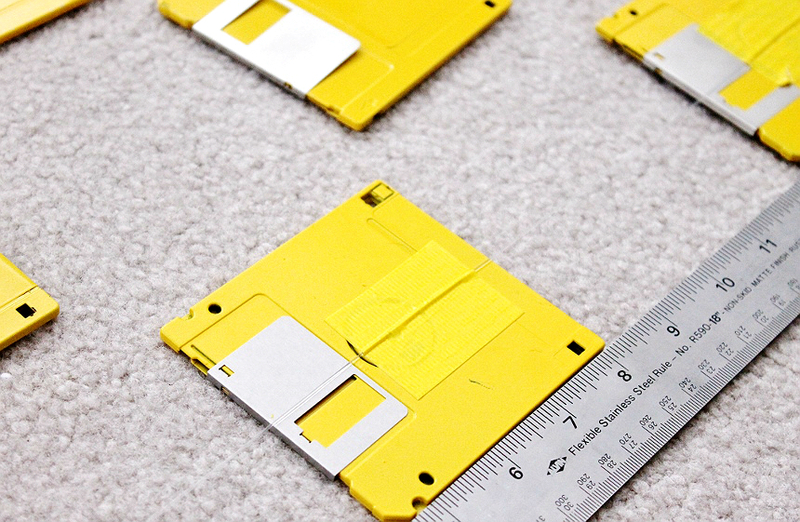 The well mentioned about the floppy disk in this post. I hope that we will get this kind of stuff in the future also. That is such incredible work right there! And all in such a structured pattern too, makes this an original artform.